There’s nothing quite like a thick, juicy hamburger (or portabella mushroom, for our vegetarian readers) with crispy, well-defined char lines and the familiar flavor of smoke and flame. For many, grilling is a year-round affair — we beat a path through the snow on our deck, stand with an umbrella in the rain, and tailgate for our favorite teams, but sweet, sweet summertime is considered prime grilling season. With Father’s Day coming up, you’re about to be inundated with ads for grills, tongs, scrubbers, skewers, you name it. So break out the steaks, burgers, and brats baby! It’s grilling time. You can’t help but have a primitive appreciation for a cooking style that’s been around since the dawn of humankind. At some point, it was decided that raw meat wasn’t a viable food option for our species, so we added fire. With a little bit of heat, we can unlock layers of flavor hidden within foods. The process of caramelization makes many vegetables taste sweeter when cooked. As fructose (sugar) is heated, it oxidizes, turning foods like onions a delicious honey brown. Meat, on the other hand, gets savory. When heated, the proteins are broken down into amino acid and create the “crunchy bits” you get on a nicely seared steak or those great lines on a burger. Couple this discovery with about 10,000 complex taste buds, and it’s a match made in culinary heaven. Think outside the box this grilling season. 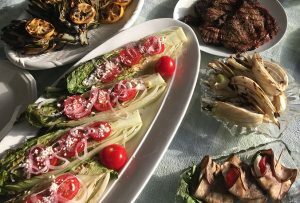 Nearly every course of your meal can be prepared on the grill — and every type of food can be transformed into a fantastic side on the open flame. Befriend a butcher: Get your cuts of meat from a butcher shop or the meat counter for the best quality. Get good grades: Because you aren’t relying on a sauce or basting in a pan, you want the best grade meat you can afford. Keep it simple: You don’t need a gazillion tools, just some tongs and a wire brush for cleaning. Keep your marbles: Steaks with marbling, the white lines of fat throughout, stay juicier and more flavorful. Start warm: For even cooking, let your steak sit at room temperature for 20 minutes before cooking. Speaking of heat: Your oven has to preheat and so does your grill. To see if it is hot enough, hold your hand over the grate. If you have to pull back after two seconds or less, you’re ready! Crust is a must: Let your meat form a sear crust or grill lines before flipping it. Otherwise, it will stick to the grill grate. Holding your fennel bulb upright cut ¼ inch slices vertically from top to bottom. Brush each side with olive oil and a sprinkling of salt and pepper. 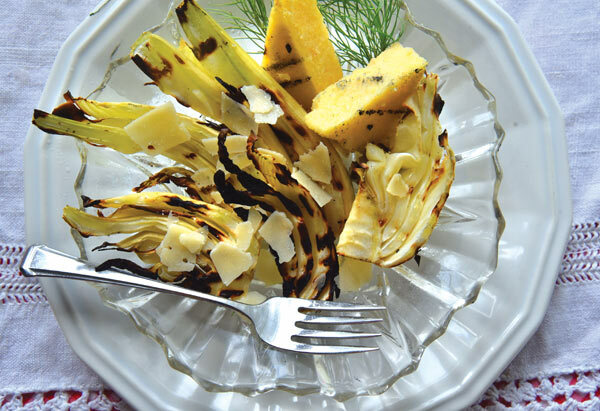 Place slices on a medium hot grill turning until you get a nice char on each side and fennel is tender to the touch. Garnish with the shavings of Parmigiano Reggiano. 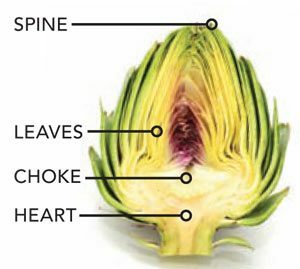 Trim excess stems from the artichokes and cut off the tops of the leaves that have the small thorn. Place trimmed artichokes in boiling water and let cook for 10 -15 minutes depending on size. Remove artichokes from water and let cool in a colander. Preheat outdoor grill. If using a grill basket, spray basket with nonstick cooking spray. 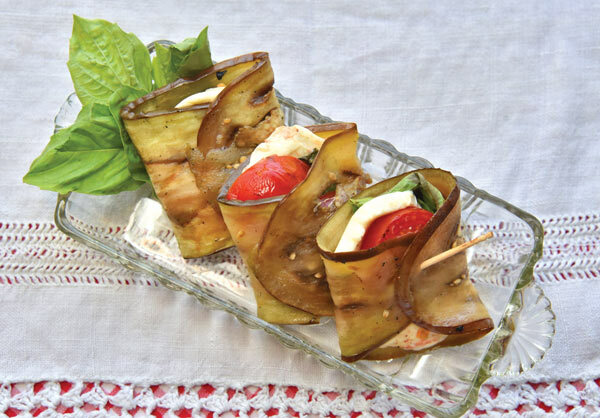 Place cut artichokes halves, cut side up on grill or in grill basket. Let the artichokes begin to char (about 4 minutes). Turn artichoke halves with tongs (cut side of artichoke down). 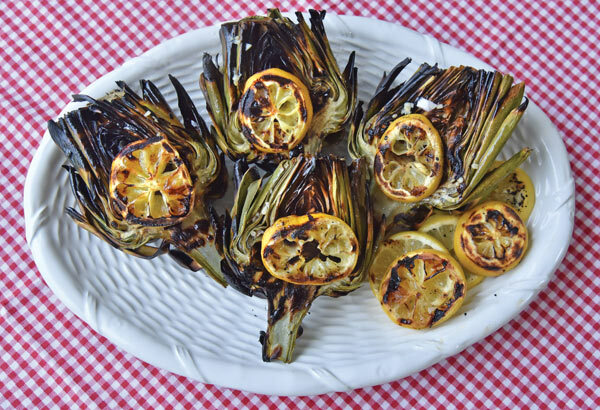 Let artichokes char on grill for another 4-minutes or until you receive the charring marks on the artichoke that you desire. In a bowl mix all ingredients for filling. And toss until well blended. In a separate bowl, mix together the yogurt, garlic cucumbers, 1 tsp lemon juice and salt. Place on the grill, and cook for 4-5 minutes to achieve a nice char. Close the lid for half the time to soften the peppers. When char level is achieved, transfer to a serving platter, and drizzle tzatziki over the top. *Quinoa triples in size when cooked. 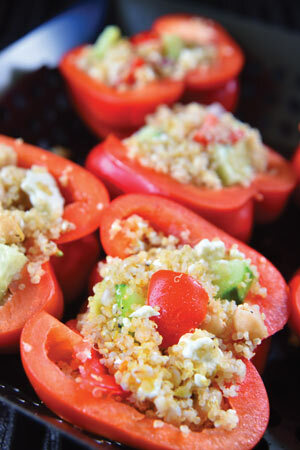 For this recipe use ¼ cup uncooked quinoa with ½ cup water (can be prepared in advance). **Lentils double to triple in size when cooked, for this recipe a good amount to prepare would be ½ cup split lentils with 1 ½ cup water. 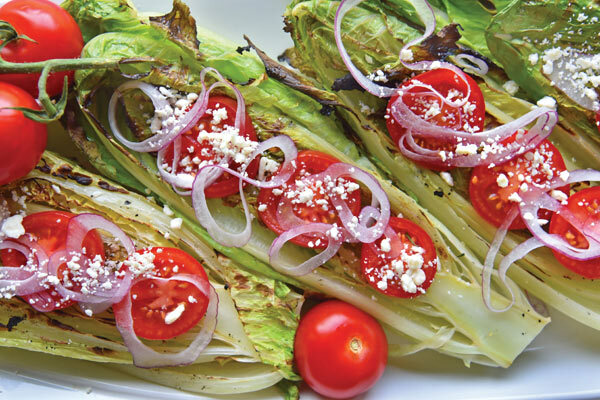 Transfer the Romaine halves to a platter. In a bowl and whisk together vinegar, oil, oregano, and minced garlic. Top each romaine half with 2 or 3 tomato slices (depending on size) a few onion rings. Add crumbled bacon and blue cheese on top. Drizzle dressing over the assembled salads and serve. Another great way to eat his salad is with fresh blue cheese dressing. Boil a pot of water, and add a pinch of salt. When water is boiling add the eggplant slices, to blanche, about 2 minutes. On a cutting board, stack two slices of eggplant in a cross. Chill in the fridge for at least 20 min. before grilling. 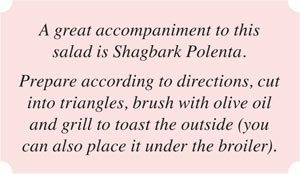 Transfer to a platter, and serve with vinaigrette.